The TMS Annual Meeting & Exhibition is a big event—with thousands of technical presentations and numerous social and networking events. 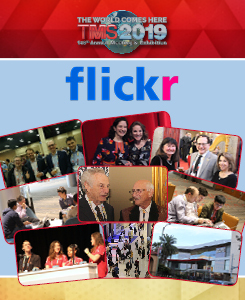 Get a glimpse of what it was like to be there by browsing TMS2019 photos on Flickr. Look through photos from the entire conference on our photostream or from individual events through the album section of the site. Full coverage of the TMS 2019 Annual Meeting & Exhibition, held March 10–14 in San Antonio, Texas, will be presented in the June issue of JOM. TMS is now gearing up for the TMS 2020 Annual Meeting & Exhibition, which will be held February 23–27, 2020, in San Diego, California. Plan to join us there! Abstract submissions will open in May. On April 9 and 10, 2019, TMS President James C. Foley represented TMS in meetings with staff members of Congressional leaders and committees in Washington, D.C., including representatives of the Research and Technology Subcommittee and the Energy Subcommittee of the U.S. House of Representatives Committee on Science, Space, and Technology. During these visits, Foley discussed legislative priorities that can impact the work of TMS members, specifically focusing on topics such as the Materials Genome Initiative, advanced manufacturing, metamorphic manufacturing, the Scientific Integrity Act of 2019, and U.S. Department of Energy Office of Science priorities. Foley began his week in Washington by attending the National Academy of Engineering Convocation of Professional Engineering Societies, which prepared representatives from a number of materials societies for their visits with government leaders. Learn more about TMS Aspires, the new TMS Strategic Plan. 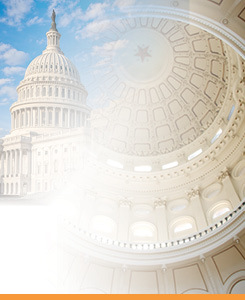 In June, TMS will return to Washington, D.C. to hold a Congressional briefing on the topic of Metamorphic Manufacturing. The briefing will be part of a series on advanced manufacturing, designed to provide Congressional leaders and their staff members with a broad understanding of the importance of these technologies. Learn more about TMS Public and Government Affairs activities. 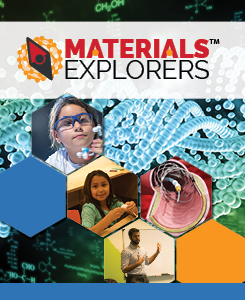 Explore “The Materials That Move Us,” a new collection of Materials Explorers™ activities that teach materials science and engineering concepts through the framework of real-world applications such as aircraft, ships, and automobiles. The Materials Explorers™ program is made up of two main components. The first is the volunteer aspect which brings TMS members into their local high schools to serve as real-life role models. Volunteers can help teachers explain complex Science, Technology, Engineering, and Mathematics (STEM) concepts by relating them to popular culture. They can also show students how materials science and engineering shapes the world around them by discussing the applications of their work. The second component of Materials Explorers™ is the collection of downloadable class activities made available to teachers, parents, and students for free. The program launched with eight distinct popular culture topics ranging from smartphones to superheroes. The newest topic area to join the collection uses examples from the transportation industry to explain the following STEM concepts: Data Collection and Graphing; Measurement and Scale; Chemical and Physical Properties and States of Matter. The update also includes the addition of a Capstone Project. The Materials Explorers™ program teaches students the scientific method and the importance of materials selection in designing a product. In the capstone project, students apply that knowledge to conceptualize and design their very own product. If you are interested in volunteering, visit the Volunteer section of the Materials Explorers™ website. Log in to your TMS account, then fill out the brief form to “Join the Volunteer List.” Alternatively, you may contact materials-explorers@tms.org for assistance. A limited number of Editor’s Choice articles from TMS journals are selected and made available to the public at no charge. This distinct honor is awarded to fewer than 5% of papers published in the respective journals each year. In addition to high-quality writing, these notable articles are distinguished by attributes such as outstanding science, innovative methods, impactful outputs, historical significance, and/or broad interest to the readership. “Three-dimensional Analysis and Reconstruction of Additively Manufactured Materials in the Cloud-Based BisQue Infrastructure,” by Andrew T. Polonsky, et al. “Repeatedly Applied Peptide Film Kills Bacteria on Dental Implants,” Cate Wisdom, et al. “Temperature-Dependent Electrical Characteristics and Extraction of Richardson Constant from Graphitic-C/n-Type 6H-SiC Schottky Diodes,” Hung Pham, et al. “Surface Disorder Engineering of Flake-Like Bi2WO6 Crystals for Enhanced Photocatalytic Activity,” Siyuan Wang, et al. 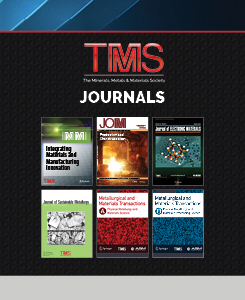 TMS members can access the full content of all of these journals by logging in to the “Journals” section of the TMS website.